We do Lucia, Midsommar, Brandboll, Girls Nights Out, Swedish kraftor (aka crayfish) party and more. There are about 75 Swedish Families in Central Florida that keep in touch. Swedes in Florida....loving the weather, except July, August, Sept and October! 1 - Jag tanker pa att bli en medlem i svenska clubben. It is a wonderful book of a young boy's life during the war times in Finland at his grandparents in Oulu, North Finland. Later he was sent to Orsa in the Dalarna region of Sweden. After several years with foster parents in Sweden, he finally returned back to Finland to his mother, sister and brother in South Finland, it was a happy homecoming after some seven years absence, but it was a shock. He found his family's life to be hard and raw. Food was scarce. They lived in a tiny firetrap apartment building. His mother worked as a prison guard and with her meager salary was barely able to support the family. His father returned from the war and immediately announced that he wanted a divorce from mother. After that he disappeared from their life without any financial support. Not long after their misery, there was a change when mother regained her old position at the Internationally famous Hotel Aulanko, The family moved to the hotel's premises, into a solid large log cabin. Now life turned out for the better. The hotel years were exciting and uplifting. Life was beautiful again. A "miracle" happened to the boy, at age seventeen, when he received an invitation to America, with all travel and living expenses paid, plus schooling in Philadelphia. He embraced his new life in America with vigor - in the land of opportunity-becoming a successful business man years later. John Raikkonen is the the Author of a new exciting memoir about Finland during the Finnish-Russian war, year 1942 to 1945 and the after effect. 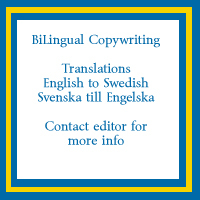 3 - I am seeking an organization/group were I can learn swedish. I am half swede (my mother's side), researching my swedish roots, along with wanting to visit my homeland some day soon - to which I would like to learn (re-learn - because I was learning swedish up until I was 2 and 1/2 years old) the swedish language. I know of no one whom I could talk to to learn swedish. Some of my swedish facebook 'friends' (Swedish Genealogy) are encouraging me to learn - and I agree. 4 - I am looking for a swedish club, organization, or individual were I can learn the language and/or culture. I want to reach my swedish roots!